Okay, I know I haven't been posting much, partially because I've been doing a lot of play stuff, partially because of work, partially because of life, and partially because of T-SHIRTS!!! For those of you who know/care the equations are for finding gravity, the quadratic formula, the mandlebrot set, the pythagoreom theorem, e=mc^2, Binomial area, the equation for pi, and the area of a circle. They're real math equations varying from algebra to advance calculus and statistics. The "NERD" is made of Pi, Sigma, correlation(or radius), and lowercase delta. I'd really like critiques on this design. What can I do to make it better? Well, I totally did not read the main word as "nerd". I read it as "pi sigma r delta? What equation is THAT?" Yeah, I think it is a bit of an obstacle that most people know that the pi symbol means pi...that threw me off too, though now I see it is sort of n-shaped. I agree with Q and Cuileann, but once I saw that it was a "n," everything made perfect sense. I really like the look though--it's just perfect. Heh. I haven't gotten that critque yet. Is it bad that it's not obvious at first? Yeah, at first, I was vastly confused, but then I read that it was supposed to say "nerd", I say it instantly and loved it. 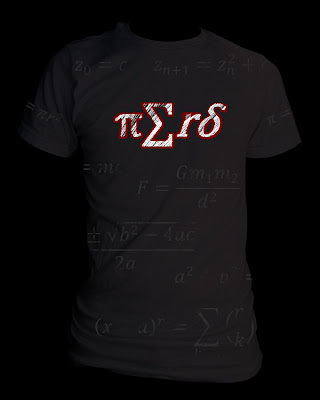 I sort of don't like the equations on the front; could they maybe go on the back? yeah, I could tell you were trying to spell something that didn't start with p by starting with pi...unfortunately I thought it was "hero" that you were going for. You could play around with Nu Epsilon Rho Delta and see if you like it. I mean, most greek letters are used in math. Heh. I know it doesn't translate exactly into the Greek. *Speaking to Jacob* I also am a nerd, but you must realise that had I put nu, epsilon, rho, and delta it would have looked like: vepd, then even LESS people would get it. YOU are a freakin' genius! Awesome shirt design! !